A few weeks ago, Fahim and I went to GeekcampSG, where Fahim was giving a talk on Useful Tools for Developers. Geekcamp was held in the Microsoft offices in the 22nd and 23rd floor, I think, so fairly high up anyway. Naturally, I brought my camera. And naturally, I took a few photos, like these two. What we have here are two photos of the Ascott Building. In the first, we can clearly see the top of the building and the pool and the deck of what I'm guessig must be an apartment. And two people standing near the door. 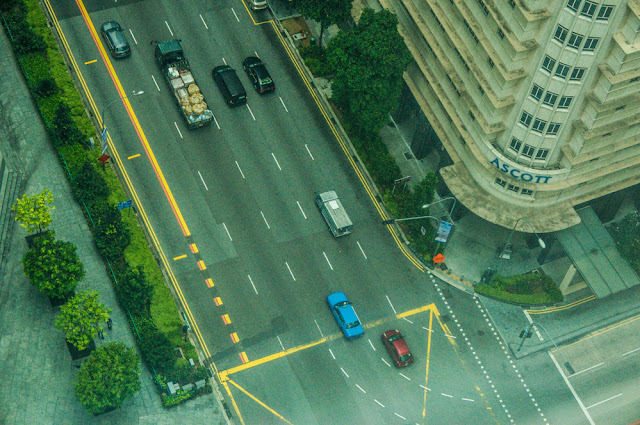 The second photo is, of course, taken from high up looking down on the front of the building and traffic. 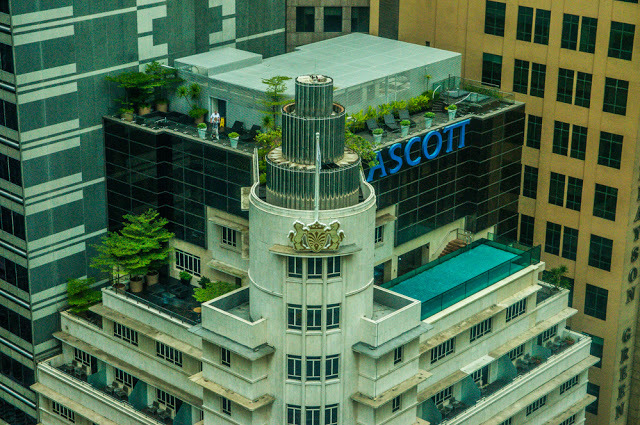 I love the architecture of the Ascott! Sometimes, even modern architecture can make me smile in an amazing way. Most of it around here is very boxy, but there is a Sheraton going up that is different. When it’s completed, I will have to post pictures. Please do post pics of the Sheraton. 🙂 I like buildings with personality, too.